A Continuous Trap card is a trap that stays face-up for the entire duration of the duel until it's destroyed or has an effect that destroys itself when a certain condition is met. A simpler way of say that is; if a continuous trap card is destroyed or removed from the field by a card like, Mystical Space Typhoon, its effect will disappear regardless if it was negated or not. Player B: Responds and activates Royal Oppression along with activating it's effect and paying 800 to destroy Blood Mefist. Player A: Chains with Mystical Space Typhoon and targets Royal Oppression. Here's another if you don't understand. Player B has Malice Dispersion and 1 card in his/her hand. Player B chains Malice Dispersion and discards 1 card. If a continuous trap card is activated but its target(s) is removed from it's designated area, then it will remain on the field with no effect. Chain Link 1: Call of the Haunted resolves but summons nothing and remains on the field. If a continuous trap card has fully resolved while equipped to a monster and later removed from the field, INSTEAD of the way it is written on the text, the continuous trap card will remain on the field with no effect. Player A has a Scrap Golem equipped to Call of the Haunted and Scrap Beast on the field. If Player A synchro summons for Scrap Twin Dragon with Scrap Golem and Scrap Beast, then Call of the Haunted will remain on the field with no effect because Scrap Golem was not "destroyed" on the field. If Royal Decree is activated on the field while continuous trap cards are on the field, those other continuous trap cards will not be sent to the graveyard. Continous traps that equip to monsters will not re-equip itself even if Royal Decree is removed. 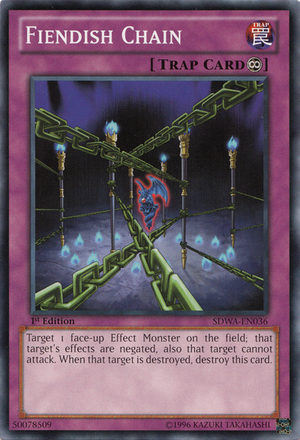 If Royal Decree is chained to a continuous trap card, the continuous trap card will remin on the field with its effect negated until Royal Decree is removed. If Royal Decree is activated while Trap Monsters are face-up on the field, they will return face-up in the Spell/Trap Zone even after Royal Decree is later removed from the field. Text: Target 1 face-up Effect Monster on the field; that target's effects are negated, also that target cannot attack. When that target is destroyed, destroy this card.